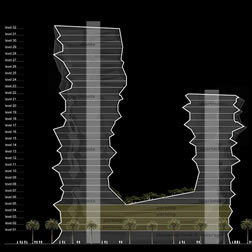 We have treated the high rise buildings as the central icon of the project. These are the gateway buildings that will be recognized from a distance, and which will be the initial attraction for visitors and residents alike. It is also the landmark location where the water moves in, approaching the inland. The architecture assumes the challenge of being on one hand aesthetically bold, and on the other functionally rational. By integrating building and structural systems, we have developed a concept that can go a step beyond, with vision. 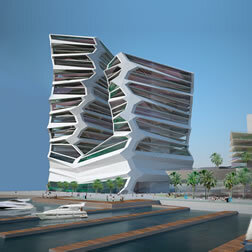 The design is reminiscent of water and dynamic as only visionary people are. We have also emphasized need for long term flexibility in our designs, by focusing the identity-making components of the concept to the external skin, and the high profile areas, while maintaining an interior that is clear, flexible and adaptable to evolving needs. The low rise is all about quality of space. These buildings will be experienced mostly from a short distance. 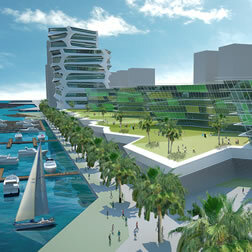 They are the areas of the Master Plan that are most fully integrated with the open space and urban design. Through the boardwalk, through the retail level, through the extended base, the Low Rise element has the function of integrating in the experience of users both the functional components of the Plan, and the aesthetic of the development. In addition to a powerful waterfront pedestrian route, we propose to generate a series of pedestrian through-connections. This will enable the ground related retail to maximize frontage opportunities, and capture additional walk by traffic. It will also enable users of the site to access (physically and visually) the different parts of the development, and the waterfront in a direct way. Ultimately we see that the Low Rise elements offer an opportunity at the intimate scale, to define and enhance the experience of users. It will also be the benchmark that leads the designs of future phases of development.